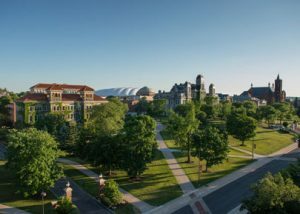 Falk College sport venue and event management students, in partnership with Syracuse University Athletics, will host the Orange Guardians Kickoff fundraiser with special guest Coach Dino Babers on Monday, April 8 at 6 p.m. at the Embassy Suites by Hilton at Destiny USA. The event will benefit Griffin’s Guardians, a local non-profit organization that supports families affected by pediatric cancer. The execution of this event is part of the sport venue and event management curriculum, in which students organize an event to gain a direct, hands-on learning experience working in all facets of the sports industry, from operations and logistics to marketing and sponsorships. Orange Guardians Kickoff will feature live entertainment, silent auction, photo opportunity with the Camping World Bowl trophy. An optional VIP experience includes a photo opportunity with Coach Babers. All guests are encouraged to wear orange. For more information, sponsorship opportunities, tables, and tickets, please visit www.ogkickoff.com.